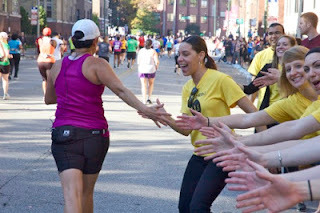 Fit-Ink: The Marathon's Over...Now What? You trained. You ran. You conquered. Well, not quite. If crossing the finish line and getting a marathon medal to wear around your neck counts toward conquering, then yes. But if you wanted more out of your marathon—ahem, a faster time, a steadier pace, a personal best or Boston qualifier, or whatever else justifies a good race—then chances are you’re wondering what comes next. You’re not ready to go out and run another 26.2 right away (or maybe you are—I know someone who raced Chicago and will be running the Nike Women’s Marathon this weekend) but you’re not that far off. The problem is that a majority of the races that come to mind—Twin Cities, Lakefront in Milwaukee, Chicago—are done and many of the big-name races—New York, Marine Corps, Detroit Free Press (have to stick the hometown race in there)—have been closed for months. So where can a girl, or guy, run these days? Here are some of my picks—local and not—for fall races to run. Oh yeah, and they’re not all marathons because after running two in less than a month, I’m definitely thinking shorter is better (don’t get me wrong—I still want to run the Chicago Marathon again). I honestly don’t know what the draw is to Grand Rapids aside from a reputation of qualifying runners for Boston time standards and being gracious enough to offer a registration deal to Chicago Marathoners back in 2007 when most of us had lousy races (it was my slowest up until 2011 when I walked almost 20 miles of Boston with a stress fracture). But don’t let my little knowledge of the race stop you. If you’re ready to run again, and you want a near guarantee of more ideal running temperatures coupled with an intimate and friendly crowd, you’ll find it here. And though it might be a little pricey to register at the last minute, it’s no worse than the major marathons. So many choices: a marathon, a half marathon and an 8K. And the race’s tagline has been confirmed by Runner’s World—it is “America’s Friendliest Marathon.” The scenic course and downhill finish attracted me to add Richmond to my must-run list way back when, granted I have yet to actually get there and do it. If those weren’t enough, in re-reading its description, I’m thinking that the on-course amenities at the 35th running (who knew it was as old as Chicago and Detroit? )—DJs, live bands, junk food, wet cloths—might top any of the other races I’ve run. You read the magazine, now run the race—or races. Runner’s World is making it a weekend of races in Emmaus with a 5K and 10K on Saturday and then a half marathon on Sunday. Run one, two or all three (can we say smaller scale Goofy Challenge?) and then see how your legs feel by the end of the weekend. Darn. I got all excited about the possibility of running this one, but then I went to website only to find the marathon and half are closed. Must be all the NYC Marathon lottery rejects. Keep this one in mind for next year—I remember it having a reputation of being a fast course, or was it flat? And even if it’s not as speedy as some other races out there, by mid-November you know you’re guaranteed chillier temps if that’s your race-day preference. Take your pick: New York, St. Louis, Los Angeles, Miami Beach, San Antonio, Savannah, Las Vegas. The Rock ‘n’ Roll Series is rolling through seven more cities before the year is out, all in desirable locations from a tourist standpoint. Who wouldn’t want to run and relax in one of these locales for a few days before returning to reality? St. Louis might be a tough sell on the paradise point (San Antonio too, but I’m thinking the Alamo attracts a crowd) and New York too, but I’d say they win out from the baseball angle with the Cardinals and Yankees in the playoffs. It’s too bad my mom lives more than 100 miles away, she's not a runner and she’d prefer that I quit running rather than do more. This female-favored race is on her birthday and its perks—a specially-designed necklace, post-race massage, wine at the after-party expo, a start/finish at Lake Geneva’s Abbey Resort—offer enough selling points to possibly change her attitude. I can’t say enough good things about this race. In fact, I’ve already contemplated running it again, though that’ll have to wait until next year. This race has caught on in popularity—maybe it’s the fast course with its gradual downhill after mile 11, the 30th anniversary, the point-to-point, the less-than-10K field—so much so that race organizers opened up the race from Oct. 1-15 for runners who want to run and have run a Boston-qualifying time (plus 5 minutes) within the last two year, and they jacked up the prices since I ran this race in 2008 and registered with only a month and a half to spare. Guess that means I need to plan ahead should I want to return for its 31st running. I may not have mentioned it above, but almost all of these races have a shorter component--and I don't mean the half-marathon type of shorter. Sure, it's not exactly justifiable to fly to Sacramento for 2.62-mile run, but if you happen to be there, it's one way to get the blood flowing on a Sunday morning. Where are you running this fall?